Hills around Vijayawada are rich with rock-cut architecture but the most magnificent and largest among these monuments is the largest of Undavalli Caves – amazing achievement of engineering, four floors high rock-cut temple with numerous sculptures and murals. 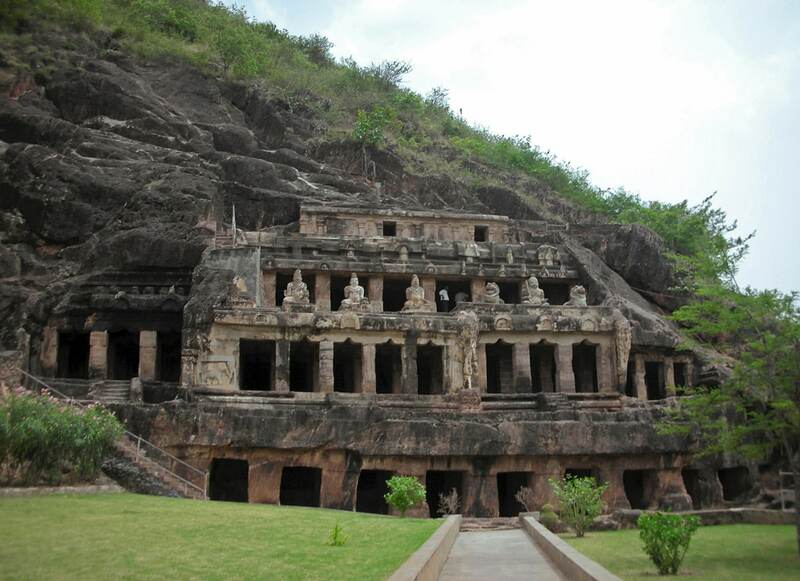 Caves are associated with Vishnukundina kings – influential dynasty ruling over significant part of contemporary India in 420 – 620 AD. Caves were dedicated by local governor Madhava Reddy to the Anantapadmanabha Swamy and Narisimha Swamy temples. 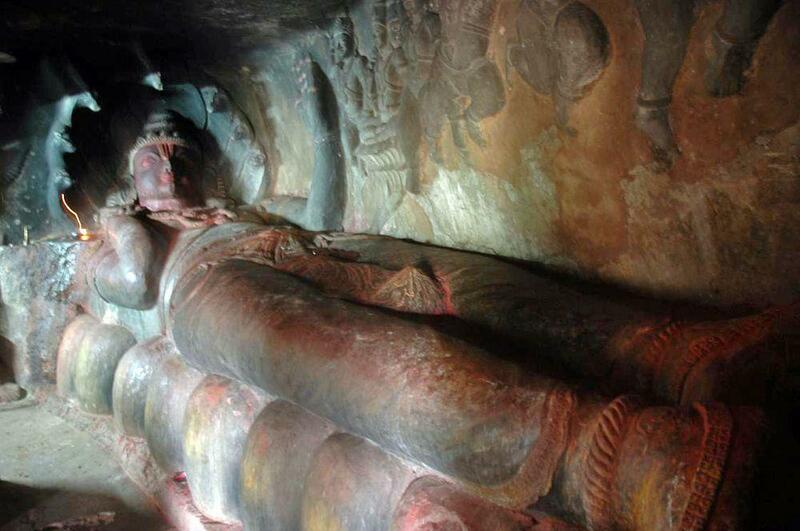 First Vishnukundina kings were supporters of Buddhism and Undavalli Caves were started as Buddhist temples. 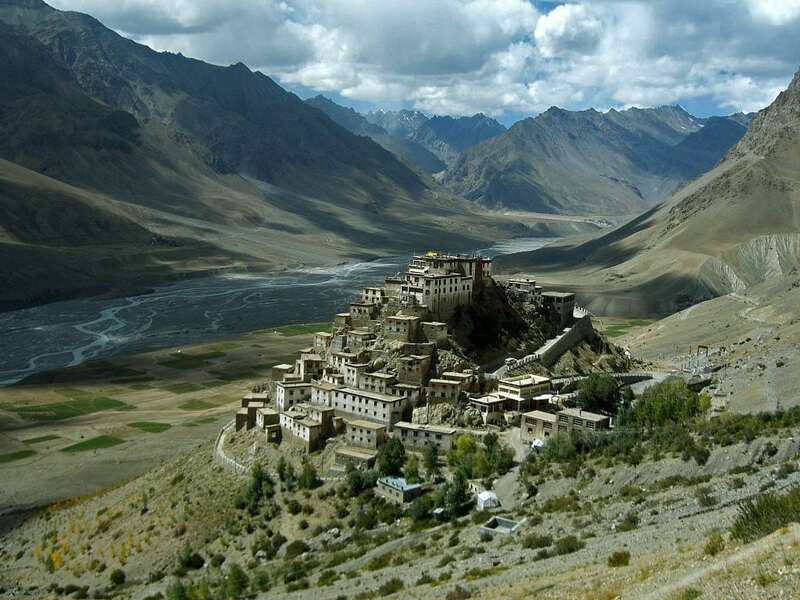 For a while they were used by Buddhist monks and there have been preserved some Buddhist statues up to this day. 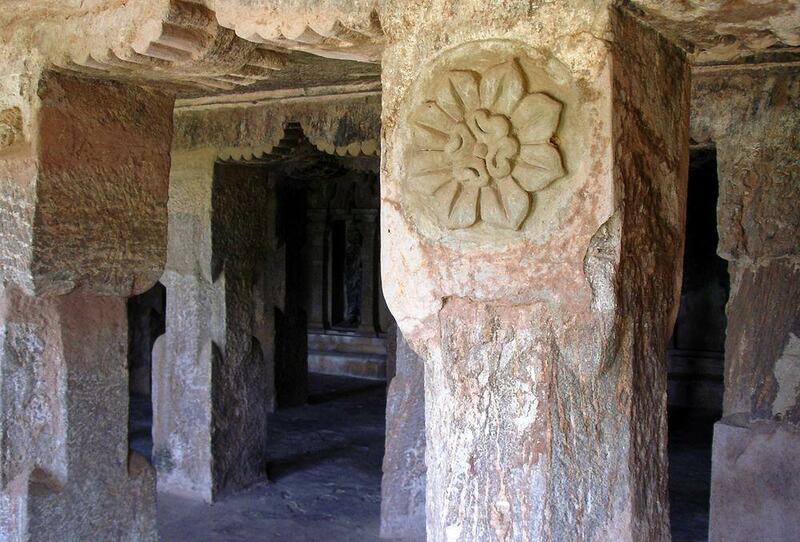 Later though caves were taken over by Hindus and major part of artwork we see here today is related to Hindu religion. There is exciting legend about the cave – it tells that here starts 9 kilometres long underground passage leading to the sacred Mangalgiri mountain. Many locals believe in its existence and consider that the entrances have been closed and hidden by authorities to avoid accidents. There are several smaller rock-cut chambers nearby but the main attention is given to the large four storied cave. From the distance it resembles an abandoned fort but when approaching it there reveals an exciting sight – whole enormous structure is cut in monolithic sandstone cliff. Caves have four stories, each successive floor recedes. Facade is 29 m wide. Cave in its planning belongs to the earliest examples of Gupta architecture although several details in the second floor show the influence of Chalukyan architecture. First floor can be entered through one of 8 – 9 roughly shaped openings with massive square columns in between. 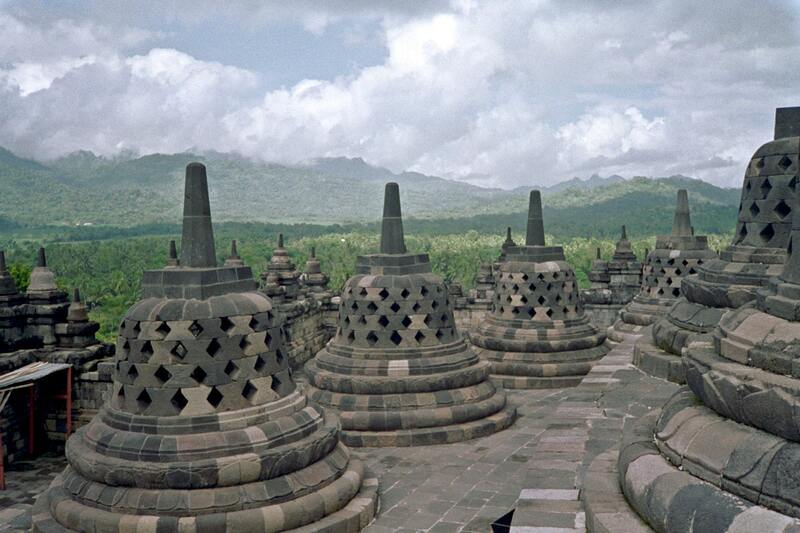 Planning and style of sculptures in the first floor shows that this was Buddhist monastery – vihara. Part of chambers are primitive rock-cut monastery cells. Hall is not completed, it contains 8 columns. 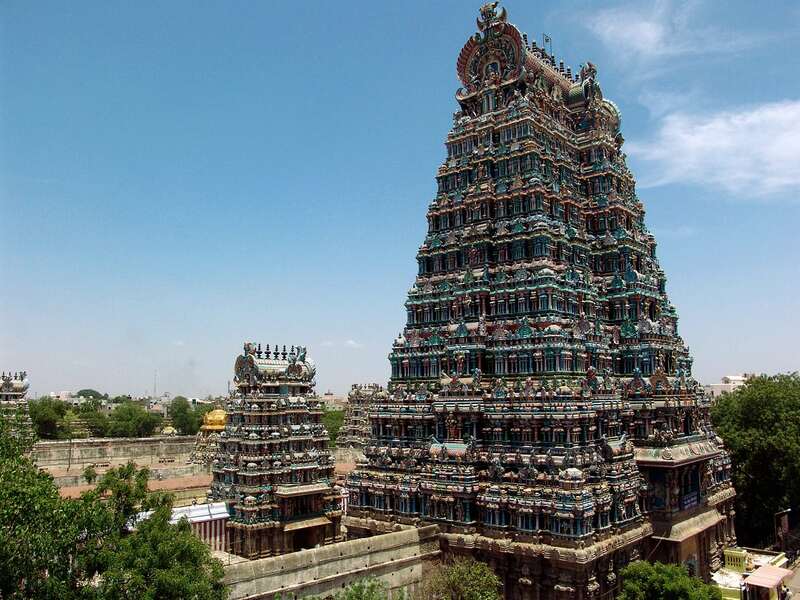 Here are three separate sanctuaries for Trimurti – Brahma, Vishnu and Shivu, each with a pillared hall in front. Trimurti is important concept in Hindu religion – a triad of Brahma, Vishnu and Shiva, embodyment of cosmic functions of creation, maintenance and destruction. Walls in the first floor are adorned with frescoes showing scenes from mythological stories and made in the 7th – 8th century AD, some paintings here have been done also in later time periods. Second floor contains the most amazing sculpture in this temple – a huge, 5 m long statue of Lord Vishnu in his Padmanabha aspect shown in reclining posture. Also this statue resembles similar Buddha statues in some other cave temples. Sculpture is made out of single block of granite. Over Vishnu there is a canopy of multi-hooded Adi-Shesha, king of all nagas, shrine is adorned with numerous other sculptures as well. Facade of the third floor is adorned with numerous sculptures, including depictions of lions and elephants. There opens beautiful view through these ancient sculptures towards other green hills and stands of palms below.